The teams devised innovative prototypes in Agriculture/Agro-electronics sector which was the theme of the Hackathon at the IIT-KGP. Kolkata: Three all-woman teams have emerged as the winner and two runners-up at the Grand Finale of Smart India Hackathon 2018 Hardware Edition at the IIT Kharagpur, a statement from the institute said on Saturday. The institute was one of the 10 nodal centres across the country for the Hackathon, each having different themes for the contending teams and would have their own winners. 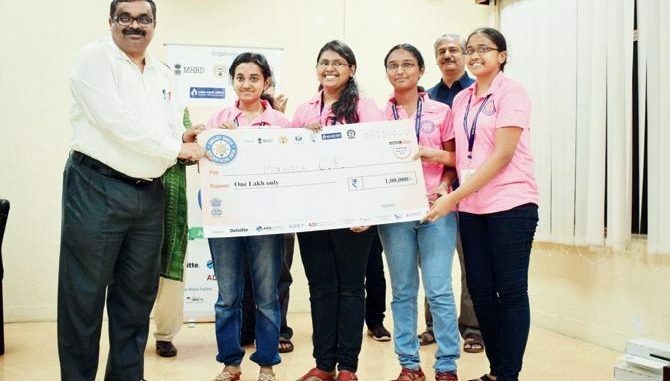 While ‘Whistling Cookers’ team of the Avinashilingam Deemed University for Women, Coimbatore, was declared the winner at the IIT-KGP, first runner-up, Team Buddies, was from the same institution, an IIT KGP statement said on Saturday. The second runner-up was ‘Team Askurvara’ from the Silicon Institute of Technology, Bhubaneswar. The winning team designed a prototype for ‘non-destructive estimation of sugar content of fruits using visible-light imaging’, the statement said. The top three winning teams won cash prizes of Rs 100,000, Rs 75,000 and Rs 50,000 respectively, it said. At the IIT-KGP, nine teams from all over the country brainstormed over the theme ‘Agriculture/Agro-Electronics’ to build their hardware solutions as a working prototype. The event at IIT-KGP saw innovations in smart drip irrigation, technology-powered mechanical harvesters and soil testing and cost-effective detection of the status of fruits and vegetables. They were among the total 150 short-listed teams in final round as the rest 141 competed at other nodal centres. The Smart India Hackathon 2018 Hardware edition was initiated by the Ministry of HRD to provide a national platform to young technical minds to showcase their innovations in devising products which can bring about significant changes in sectors like agriculture, health, clean water, waste management, automotive, smart communication and education. The event was inaugurated on June 18 by Union HRD minister, Prakash Javadekar through video-conferencing.